I got myself a new lens last Saturday - Canon 55mm f/1.8 II. It's a very inexpensive lens with not so great build quality, but has very good sharpness. I picked it up mostly for low light photography and times when I need a great DOF. Here are few first trials with it. Dragon under red light. ISO 100. F/3.5. 5 sec. 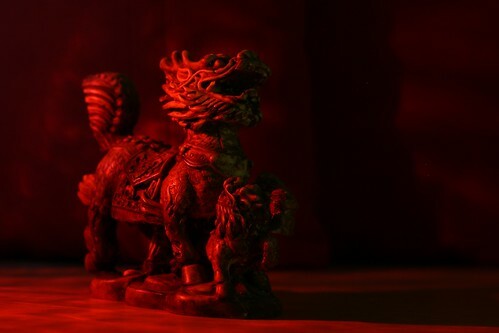 Dragon against chinese lamp. ISO 100. F/3.5. 6 sec. The below pictures were taken on a whim. Multiple shots of a withering flower, taken over an hour or so. I would appreciate your comments, and if you have used this lens it would be great if you can share your advise regarding this lens. I also take this opportunity to announce my new blog named "wownder". Wownder stands for wow and wonder; it is an appreciation of the wonderful world around us by an enquiring mind. Any suggestions from you would be highly valuable to me. If you like it, do subscribe in to get the daily dose delivered directly to you. I won't say much here and would leave you with the blog URL and let you be the judge. Please visit wownder at http://wownder.windforwings.com/ and tell me your reactions. 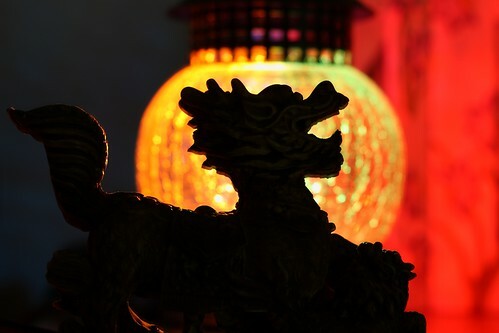 I loved the dragon against the Chinese lamp!